A fringed scarf uk format for you to crochet, It is made in easy tr and dtr stitches and is soft and warm to wear, I have made it in random colour yarn, but you could easily make in a solid color if you wish. See my free Ladies Scarf and Neck Warmer Cowl patterns. Next Row – 3ch, 1tr into each of next 2tr, * fpdtr (see abbrev) around next tr, 1tr into each of next 3tr, * rpt from * to * to last 2tr and 3ch to turn with, 1tr into each of next 2tr, 1tr into top of 3ch. Turn. Pattern Row 1 – 3ch, 1tr into each of next 2tr, * bpdtr around next dtr, 1tr into each of next 3tr, * rpt from * to * to last 2tr and 3ch to turn with, 1tr into each of next 2tr, 1tr into top of 3ch. Turn. Pattern Row 2 – 3ch, 1tr into each of next 2tr, * fpdtr around next dtr, 1tr into each of next 3tr, * rpt from * to * to last 2tr and 3ch to turn with, 1tr into each of next 2tr, 1tr into top of 3ch. Turn. Rpt Pattern Rows 1 & 2 until 114 rows have been worked in all or work measures approx 60 Inches from beginning. Turn. At each end of the scarf with RS facing thread 10 tassels in alternate dc’s, by folding each tassel in half and threading the open ends of the tassel through each dc, pull through loop you have created and secure, trim to make even. 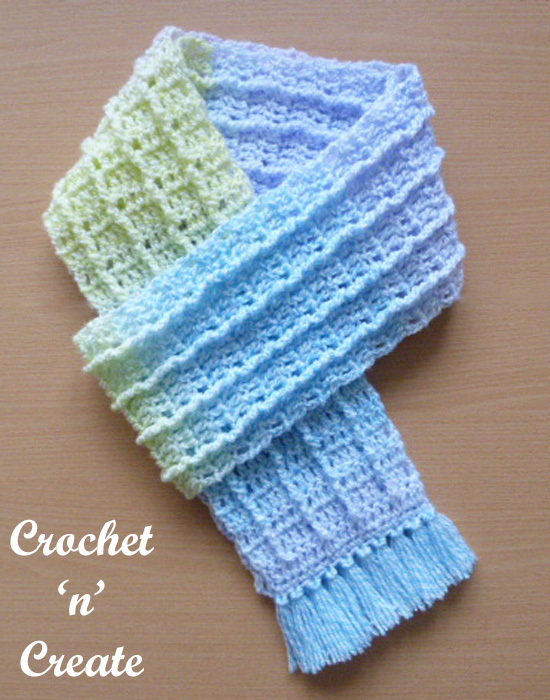 Hope you enjoy this warm free crochet pattern for a fringed scarf uk format. The written instructions and pictures for this fringed scarf uk pattern are copyrighted to crochet ‘n’ create © 2017. You are welcome to sell the finished products made from the free crochet fringed scarf uk pattern, I just ask that you please use your own pictures and put a link back to crochet ‘n’ create. 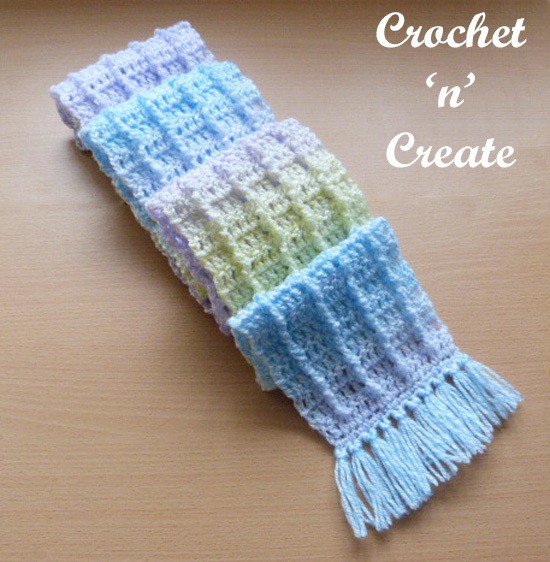 If you wish to share this crochet fringed scarf uk pattern on social media or your blog please only use a direct link to the pattern page on crochet ‘n’ create. This entry was posted in crochet scarves, free crochet patterns and tagged crochet, crochet scarf, free crochet patterns, scarf on 20th October 2017 by crochetncreate.